Our South Florida-based private jet company utilizes the following airports to fly clients privately to/from Tampa, Florida and neighboring areas of Florida’s Gulf Coast. 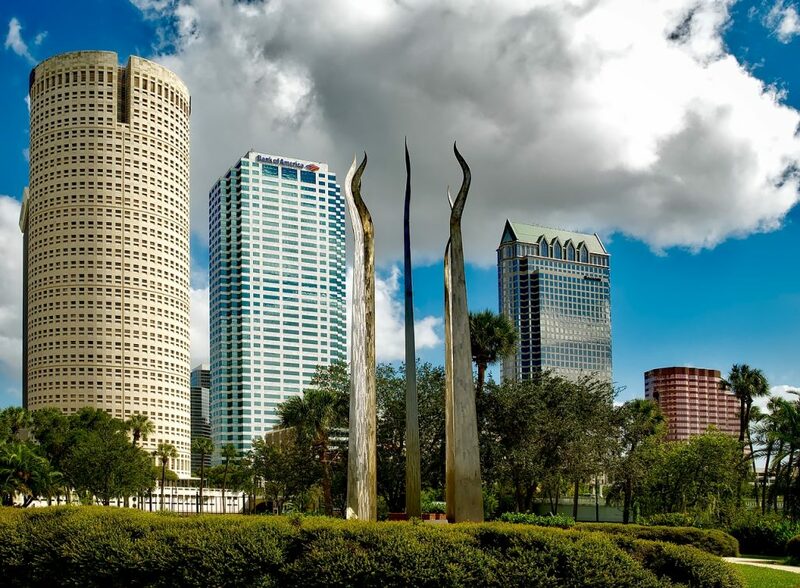 There is a total of 17 airports located within 50 miles of downtown Tampa, each offering flexible arrival/departure options for clients flying to the Tampa/St. Pete area. Check out more details below, and call us to review the airports for your flight. Visit Florida’s Sun Coast by renting a private jet, turbo-prop or piston aircraft to Tampa International Airport (IATA: TPA, ICAO: KTPA, FAA LID: TPA), an airport located 6 miles west of Tampa in Hillsborough County, Florida. The international gateway into the Tampa Bay Area, TPA handles over 16 million passengers a year, and (KTPA) Tampa Int’l is one the only airports in the United States with scheduled service to four Cuban cities: Camagüey, Havana, Holguín and Santa Clara. (TPA) Tampa Int’l owns its fair share of accolades, too — Zagat Survey ranked TPA the “Best Overall U.S. Airport” in 2007 and 2008, then dropped it one spot to second overall in 2009 and 2010; Condé Nast recognized it as the world’s second-best airport in 2008, coming just two-tenths short of first-place; CNN ranked it sixth and was the only US airport among ten of the world’s most loved airports in 2011; for many years, TPA has consistently received high customer satisfaction ratings from JD Power and Associates. Private jets can utilize one of 3 runways measuring 11,002 feet, 8,300 feet and 6,999 feet, and helicopter can be arranged using it’s dedicated 100 x 100 foot helipad. FBO service is offered by SheltAir Aviation and Signature Flight Support. Book your private flight to (KTPA) Tampa International Airport today! Fly via private piston or turbo-prop to Peter O. Knight Airport (IATA: TPF, ICAO: KTPF, FAA LID: TPF), an airport on Davis Islands located five minutes from downtown Tampa. The city’s main airport from 1935 to 1945, it’s still used by general aviation operators today due to its proximity. Executives flying in a piston or turbo-prop can arrive/depart using one of two runways, (4/22) 3,580 feet and (18/36) 2,688 feet, and the private terminal at (TPF) Peter O. Knight offers FBO service by Atlas Aviation. Rent a business jet and fly your executive to Tampa Executive Airport (ICAO: KVDF, FAA LID: VDF), formerly known as Vandenberg Airport, located in unincorporated Hillsborough County. The airport’s location at just 6 nautical miles east of the central business district of Tampa (15 minutes) make it a popular choice for business jet and executive flights. Tampa Executive has two runways measuring 5,000 feet and 3,264 feet, and the airport is operated by Volo Aviation, who also provides fueling and FBO service. (VDF) Tampa Executive Airport is open from Monday through Friday from 7AM until 10PM, and on Saturday and Sunday from 7AM until 7PM — after-hours service is available upon request. Book your private jet and Fly2PIE — that is, fly to St. Pete–Clearwater International Airport (IATA: PIE, ICAO: KPIE, FAA LID: PIE), an located in Pinellas County 9 miles north of downtown St. Petersburg, 7 miles southeast of Clearwater, and 17 miles southwest of Tampa. Since TPA handles the majority of commercial traffic in the Tampa Bay area, (PIE) St. Pete–Clearwater is often the preferred airport for private planes and executive jets. Facilities at the airport include a single terminal with 13 gates, and two asphalt runways measuring 9,730 feet and 5,903 feet in length. Executives flying to meetings in the Clearwater area can arrive at Clearwater Air Park (IATA: CLW, ICAO: KCLW, FAA LID: CLW), a city-owned public airport located 3 miles northeast of Clearwater’s central business district in Pinellas County. Private turbo-props and piston aircraft can use (CLW) Clearwater Air Park’s single 4,108 foot runway for arrivals/departures, and FBO service is offered by Clearwater Airpark. Fly private to Albert Whitted Airport (IATA: SPG, ICAO: KSPG, FAA LID: SPG), a public airport on the west edge of Tampa Bay, just southeast of downtown St. Petersburg and east of the University of South Florida St. Petersburg. The airport features two runways measuring 3,677 feet and 2,864 feet in length, and FBO service is provided by Sheltair. (SPG) Albert Whitted Airport hosts the IndyCar Series’ Honda Grand Prix of St. Petersburg each spring. Have any questions regarding Tampa-area private jet airports for your upcoming flight? Call us at 1-888-987-5387 to speak with one of our brokers and discuss all of the available airport options for your flight to Tampa, Florida.